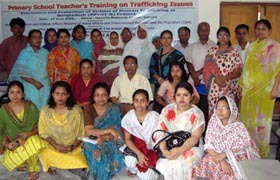 YPSA organized workshop on “Prevention of human Trafficking” for the primary school teachers at Comilla Upozilla Resource Centre, Comilla with support from Ministry of Women and Children Affairs, Government of Bangladesh and IMO. Shanjita Das, Education Officer of Comilla presided the workshop. Ms. Shumal Kumar Mazumder, Primary Education Officer, Comilla District was the chief in the workshop. Nominated teachers from different primary schools of Comilla district participated in the workshop.